Microwave 1 stick (½ cup) of butter in 30 second intervals until completely melted. Whisk together sugar, dark brown sugar, oil and cooled melted butter. Add baking powder, baking soda and sea salt. Mix well. Sift in flour two cups at a time. Whisk together then add in milk. Whisk in cinnamon, nutmeg, and ginger only two to three times. While the batter is chilling combine vanilla bean scrapping from two vanilla beans with sugar, either whisk or break up the vanilla bean seeds with fingers. For cinnamon sugar, combine sugar and cinnamon stir gently. With an ice cream scooper or piping bag using a ziplock bag, fill cups 2/3 full. Bake for 15 to 20 minutes if using the regular muffin tin or 25 to 30 minutes if using the King Size pan. Stick a toothpick into a muffin, if it comes out clean it is ready. Let the muffins cool for five minutes in the pan then let them cool on a wired rack completely. Melt 1½ sticks (3/4 cups) of butter, let it cool slightly. 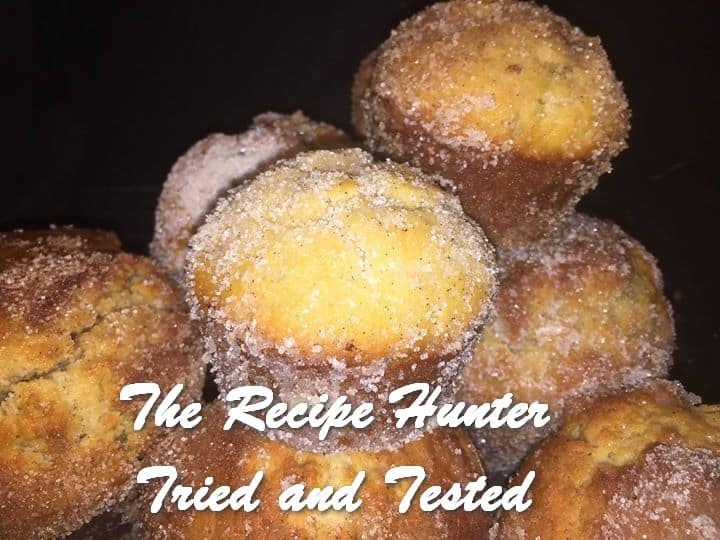 Dip one doughnut muffin in melted butter, coat the muffin well using a rolling and brush method then roll muffin in either the vanilla bean sugar or cinnamon sugar well. Let the sugar coating set for 5 to 10 minutes before consuming. Thanks my dear – I am sure Luci will love to hear this.